KawaiiPunk - Kawaii Mascot Blog: Smonsters at Shandy Sparks! See? I told you so. 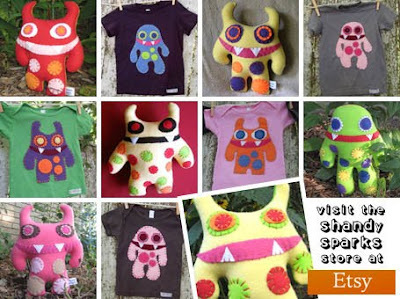 These cute little creatures, or Smonsters, to give them their proper name, can be found at the fantastic Shandy Sparks Etsy store. And, not only can they buy ice cream whenever they want, they also do a pretty good job of keeping scarier monsters away! Specialising in ‘under-the-bed-lurking beastie removal’ and ‘closet-creeping goblin whomping’ these guys are just the ticket for anyone looking for a fun and friendly monster to keep them company. And… you can even request them in you favourite colours too! How cool is that? Hi! I am so sorry I didn't see this earlier, but I wanted to say thanks for the kind words! The Smonsters happily take a moment from their creepy creature clobbering to say "WOOO! THANKS!"